Some of the biggest athletes in the world are now turning to organic juices to help them perform on the field. Some of the world’s biggest athletes have jumped into juicing, the health world’s latest craze. “Everyone thought I was crazy. What’s this juice, what are you guys talking about. Girls who do yoga, they are the only ones who juice,” Mark Teixeria, former New York Yankees first baseman told FOXBusiness.com. Juicing, the process of extracting juice from plant tissues such as fruits and vegetables into a liquid form, has gone from a 1990’s fad to mainstream. Top athletes from Major League Baseball and the National Football League are picking up the habit to help improve their game. “You see [New England Patriots quarterback] Tom Brady carrying around Juice Press. 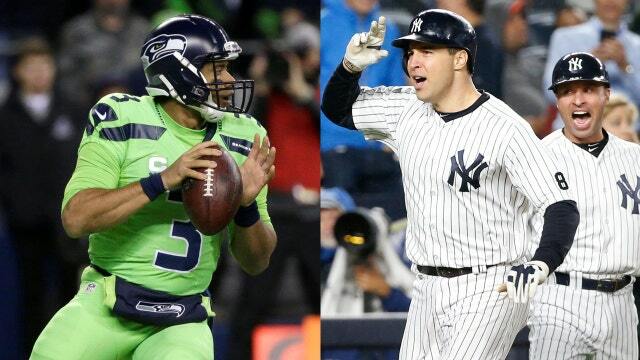 You also see [Seattle Seahawks quarterback] Russell Wilson and [New York Mets pitcher] Noah Syndergaard. You have these great athletes, who are all at the top of their game, and they see the benefit of juice,” Teixeira added. After retiring last year from playing baseball for 14 years, Teixeira said juicing has helped him on the field so much that he even asked to become an investor in a New York City-based startup called Juice Press. But he’s not the only athlete to take notice of the company: Seattle Seahawk’s quarterback Russell Wilson has also invested in the cause with plans to open the company’s first West Coast store in Seattle this year. Juice Press makes 100% USDA organic juices that are cold pressed instead of pasteurized, which helps maintain some of the nutrients that would otherwise be lost during the heating stage of pasteurization. “[Teixeira and Wilson] are very authentic sponsors of the company. They not only believe in the product and understand it but they use it on themselves,” Marcus Antebi, founder of Juice Press told FOXBusiness.com. Antebi founded the company in 2010 after becoming frustrated with the unhealthy, sugary juices that were on the market. He wanted to create a nutrition platform that included not only juices but food and supplements that made it easy for people to eat a raw diet. Juice Press has since grown to 60 locations around the country, with expectations they will hit 85 stores by 2017. “I think juicing wasn’t always necessary 100 years ago because food was totally different. People had access to sunlight, clean drinking water, fresh air, and they weren’t as intoxicated as they are today with processed food,” Antebi said. But it’s not just athletes gulping down fresh-pressed juice. According to market research firm IBISWorld, in 2015, juice and smoothie bars generated over $2 billion dollars in revenue, with juice being the largest product segment. Michael Karsch, chairman and lead investor at Juice Press said the company’s valuation has grown from $15 million in 2013 to $100 million in 2015 as sales have grown six-fold. “When I first entered the business, it wasn’t clear to people if it was a hobby or a business. And, to a certain extent, perception has changed. We have proved that it can be a real business,” Karsch told FOXBusiness.com. Juice Press might have athletes on its side, but it’s not alone in the market. Other big retailers are also getting into the cold pressed market craze. In 2011, Starbucks (NASDAQ:SBUX) purchased Evolution Fresh, a southern California based juice and smoothie company for $30 million dollars. In 2012, Hain Celestial Group (NASDAQ:HAIN), a leading organic and natural products company, purchased BluePrint, another raw juice cleansing company based in New York City. Teixeira says even though he’s retired now, he still juices every day and has seen his body fat go from 13% to 7%. And, while he hopes his new business venture grows, he truly wants it to have a deeper impact in society.